other programs. 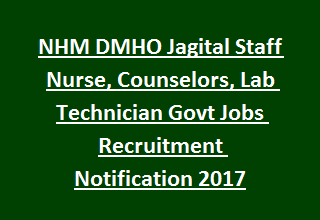 Last date for submission applications for this DMHO NHM Jagtial District staff nurse jobs is 03-11-2017. Application form is available for download at Jagtial district website of Jagtial.telangana.gov.in. Candidate’s selection will be based on merit and certificates verification. Initial a provisional list will be released based received application for this DMHO Jagtial District Staff Nurse and other posts. Based on provisional list candidates will be called for Certificate verification at NHM DMHO Office Jagtial . It is mandatory to bring the original documents for attending the certificate verification for staff nurse, counselors and Lab Technician vacancies in Jagtial district NHM DMHO Vacancies. There are total 27 vacancies in this Jagtial District NHM DMHO vacancy. 3. Lab Technician Jobs-Intermediate with DMLT course or B.Sc from recognized university and must have registered with para medical board of Telangana. After receiving applications a provisional list will be prepared based on candidates marks percentage and caste details. Candidates who are in provisional list they have to attend the certificate verification as per given notice. After certificates verification a final merit list will be released for posting the candidates. Download Application form from DMHO Jagtial Website of Jagtial.telangana.gov.in. Fill all the details and submit the application form to DMHO Jagtial District office on or before 03-11-2017 along with all certificates photo copies and other related documents.